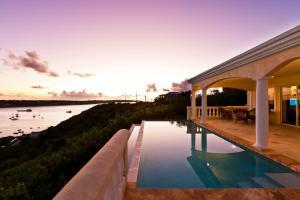 Located on the seafront in North Hill Village, Spyglass Hill is a stylish villa with a private pool, hot tub and a gym. It has a furnished terrace with wonderful ocean views. This luxurious self-catering villa features 4 spacious bedrooms, living and dining areas, a fully equipped kitchen and BBQ facilities. Free WiFi is available throughout. Free parking is provided at Spyglass Hill. Sandy Ground Beach is just 2 km away and Anguilla Airport is 3 km away. Rendezvous Bay Beach and Blowing Point Ferry Terminal are within a 10-minute drive.